For whatever reason, I’ve been feeling a little blue this week about writing and whatnot. Which is odd, since it’s the week that my book is officially released out into the wild. But, I suppose, wherever you are in your writing career, there are always new challenges, doubts, and worries, and you never know when they’re going to sneak up on you. Which is why I was so pleased to see Michael Czyzniejewski ‘s write-up of “The Monitor,” one of the stories in Bystanders, on his awesome Story366 blog this morning. In case you’ve missed it so far, Mike is writing about a different short story every day for the whole year. Ambitious! Awesome! Check it out. His review of “The Monitor” is great, and much appreciated. But more than that, it got me thinking about the way that writing friendships work, and the way that encounters and generosity and a little bit of luck open up opportunities and connections and friendships. Way back when in grad school, I would read Mid-American Review. Mike was the fiction editor then, and a damn fine one with a stellar reputation. The publication was on my bucket list. I sent him anything I vaguely thought might be worthy, and got a lot of rejections back. Some with handwritten notes, others not, but trust me, I remember those little scribbles. They were a sign of an actual person behind this mysterious process. When I finally got a story accepted by him, it was like I’d made it. I remember dragging my coworker to the bar in the middle of the afternoon for a sneaky celebratory drink. Later, that story was included in my first collection. Later, I met Mike in person at AWP. I became the editor of SmokeLong Quarterly, and actually got to publish some of his stories. 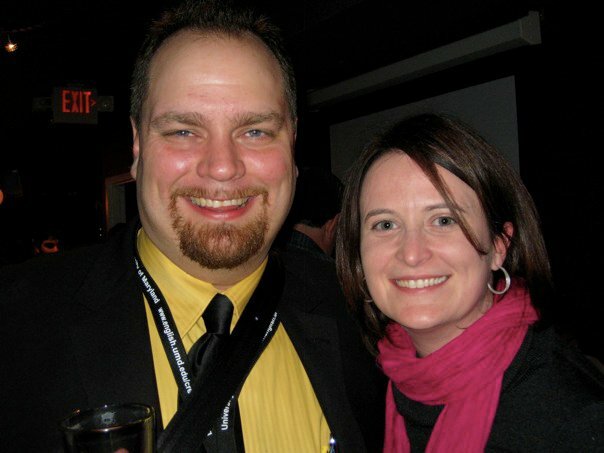 Then he read for us at an off-site event in D.C. (The picture with this post is us, circa 2010! Look how happy we look!) We chatted occasionally on social media. A few years ago, Mike interviewed one of our authors for the quarterly issue, and the interview was so great that I jokingly told him he should just be our interview person. Not only did he say yes, but so did his amazingpants wife Karen Craigo. And so goes the weird, crazy, wonderful, sometimes frustrating but always interesting circle of writing life: the faceless editor I used to spam with my work in grad school now works with me on a publication. This is not a particularly unusual or special story. I’m sure most every writer has a similar experience to share, probably dozens of them. But I needed to reflect on it this week in particular, when it seems like the writing world is too big. That there are too many of us trying to do the same thing, that it’s hard to write and even harder to get that writing in other people’s hands. All of that is true, but it’s precisely those reasons why its worth it as well. Yep, there’s a lot of us. But that’s all the more to “get” what we’re trying to do and sympathize. It’s all the more to meet and learn from and have beers with. It’s all the more who spend what little free time they have to write a review or send you a quick note or slog through submission queues to publish your work and give you a voice. So thank you, Mike and all of my other writing pals out there–too many, thankfully for me, to name–for your friendship and for all the opportunities you’ve provided to me throughout the years. And thank you for being amazing writers and editors and support groups. I feel quite lucky to have you all and to be able to call you friends. And speaking of awesome writing people, I wanted to give a quick shout-out to Chris Irvin, Paul Tremblay, and Erin Fitzgerald for making our panel at the Newburyport Literary Festival this past weekend look good. We chatted about violence in literature (and the occasional movie), and I really enjoyed it. I also enjoyed Paul’s reading later that afternoon–which was given to a SRO crowd. If you haven’t checked out A Head Full of Ghosts yet, you need to. Just don’t read it late at night.